Blasting SMS campaigns to customers who are already engaged with your brand is a must for SMS marketing. Customer engagement doesn’t last forever and needs to be nurtured. Today we’ll show you how to create segments with engaged customers who have already taken actions on your SMS promotions. These are the available customer filters you can use as part of the SMSBump segment rules. They will allow you to build segments based on how your customers interacted with your texts. The SMSBump app actions let you combine customers who behaved differently or similarly into a segment. You can use the quality and behavior of subscribers as a very significant part of building your successful SMS marketing strategy. Let’s overview the different app-related segmentation rules you have in SMSBump. Customers who are already part of your SMSBump contact lists. If you already have your own subscriber lists built, you can use them to form different segments and combine other customer filters to create an audience for your personalized SMS campaign. Use SMSBump to build segments that feature your subscriber lists and separate engaged customers from non-engaged subscribers. This lets you craft different SMS campaigns for each segment. One that is built to reach engaged customers with your exclusive deals and another that aims to encourage non-engaged users to purchase. For example, you might want to take one of your larger Text marketing lists and add a filter that only targets the ones who spent over $150 in the last 3 months. Now you can import your contact lists using the new MailChimp integration! Customers who were already reached by SMS marketing campaigns you launched. Say you want to get the customers who were already included in an SMS marketing campaign and you want to sort them. This segment rule gives you a few different angles. Isolate your inactive subscribers from the engaged customers using these segment rules. This will give you all the customers who were active on your SMS marketing campaigns so you have a clear view of the potential subscribers you can target again. Customers who made an order in your Shopify store from an SMSBump message. 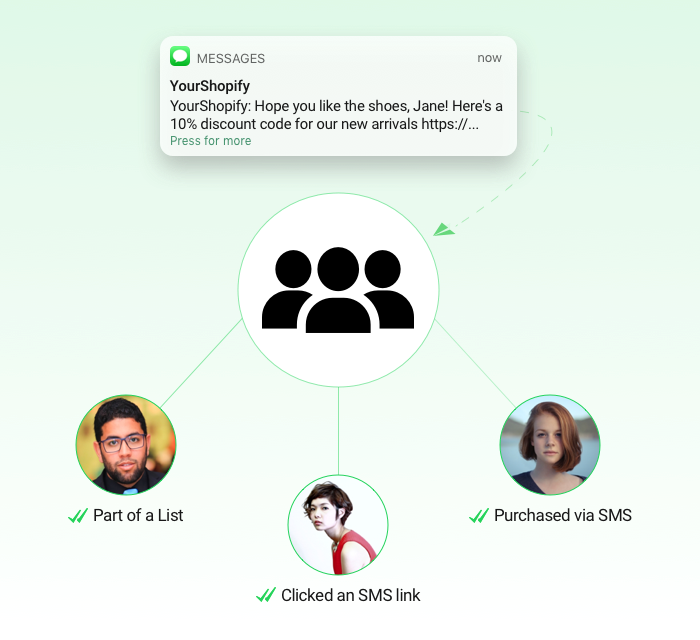 This segment rule will add all the customers who have made an order in your store from a text message you sent them via SMSBump, whether it’s an automation or an SMS campaign. Build this segment and keep an eye on how many highly engaged customers are converting from your SMS campaigns. This is the segment that will be a perfect target for your customer loyalty and retention strategies. Customers who clicked a link from an SMSBump message. This is a segment rule that gives you all the subscribers who clicked on a link, regardless if they made an order or not. This segment rule can be used in case you want to add the subscribers who clicked on a link from your text messages sent by SMSBump. This is regardless if the customers made an order or not, the filter gives you the ones who clicked. These are customers who are interested in your store and engaged with your marketing messages so they can be added to a segment that you plan on reaching with future SMS promotions. Customers who haven’t confirmed their SMS subscription. In case you’re using the double opt-in method in SMSBump, your customers need to confirm their subscription. This segment rule gives you the ones who have NOT confirmed their subscription. Although they haven’t explicitly given their consent, you can try to send a second SMS notification to remind them if they still want to confirm their subscription. Sometimes it's easy for people to forget, it’s always a good thing to follow up and remind your customers so you can keep growing your SMSBump lists and segments. You can build segments of inactive recipients, engaged customers or retarget users you already reached with a previous SMS marketing campaign. These are the app-related actions you can use to segment your target audience in Shopify. They can help you build the segments with the customers who have the highest potential to keep shopping from your store.